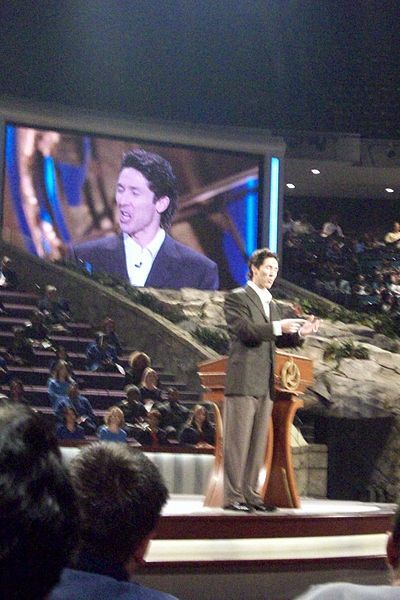 Joel Osteen preaching at Lakewood Church. 8 December 2007. Joel Osteen, a popular Christian television evangelist, reaffirmed his belief this week that Mormons are “true Christians,” putting him at odds with many other prominent evangelical leaders who frequently accuse Mormonism of being a non-Christian cult. Joel Osteen is the pastor of Lakewood Church in Houston, Texas, which is often dubbed by the media as “America’s largest church.” His sermons are broadcast to approximately seven million viewers each week in over 100 nations worldwide. This is not the first time that Osteen has stood up in defense of Mormonism’s being included under the umbrella of Christianity. In 2007, when Mitt Romney began his first presidential bid, Osteen stated that though he hasn’t studied the LDS Church in-depth or dwelt on the supposed-controversial aspects of Mormonism, from listening to and interacting with members of Church that Mormons are Christians. This issue among others has caused Osteen to be criticized by his Evangelical constituents who have accused the mega-church preacher as too theologically liberal. His sermons have been criticized by other Evangelical leaders for their lack of emphasis on man’s sinfulness and for Osteen’s lax use of the Bible in his preaching. In response Osteen has stated that he has chosen to focus his sermons on the goodness and mercy of God rather than man’s sinfulness. Others, including many Mormons, have praised Osteen’s preaching style for its emphasis on performing good works and service to others. Thank you for your post. It’s really helps me to open my eyes on what i really believe.